TAIPEI (Reuters) - Several thousand pro-independence demonstrators rallied in Taiwan's capital on Saturday to protest against Beijing's "bullying" and called for a referendum on whether the self-ruled island should formally declare independence from China. 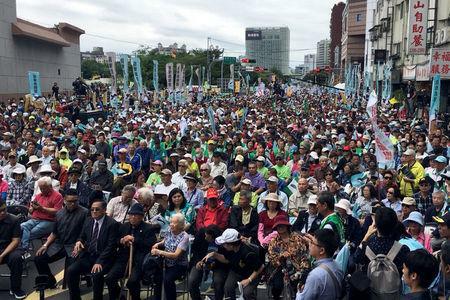 The rally, one of the largest seen on Taiwan this year, was organized by a group called Formosa Alliance founded six months ago, and the protesters gathered near the headquarters of President Tsai Ing-wen's Democratic Progressive Party (DPP). Kenny Chung, a spokesman for Formosa Alliance, described the turnout as "very successful". Protesters said Tsai's government should push back against Beijing, and advocated a referendum on independence to avoid being "swallowed up". Some carried placards bearing the message: “No more bullying; no more annexation". Tsai said last week she will maintain the status quo with Beijing, but she also vowed to boost Taiwan's national security and said her government would not submit to Chinese suppression. Beijing has already been irked by the Taiwanese government's approval for a referendum next month to decide whether to enter future Olympics events as "Taiwan" rather than "Chinese Taipei", the name agreed under a compromise struck in the late 1970s.